You probably got into the restaurant industry because you love food, right? You’ve come up with a great concept and menu, there are customers in your seats, and you’ve developed some regulars. But how do you keep customers coming back for more? The restaurant and food industries are an ever-changing landscape of ideas, food, and flavors rushing together, with fads that last a day and methods that are used for centuries. Change is imminent in these industries because consumers get bored and are ready to move on to the latest and greatest concept. Restaurants that are complacent with their food offerings are doomed to lose the public’s interest. Customers look for new, fresh, and exciting items to order when they come to your restaurant. And unless you’re a famous mom and pop diner that has had the same menu items since 1953, it doesn’t matter how great your food is. Changing your menu will help entertain regular customers and attract new ones, which will put your restaurant in a sweet spot for innovation. What’s doing well on your menu? Is a dish costing you too much? Are you making enough on a dish? Are these ingredients too seasonal to keep the item profitable all year round? Answering these questions can help you really put each of your menu items under a microscope and analyze their performance in your restaurant. It is important to pull your general manager and purchaser in on the breakdown to help you through the process of what stays and goes. Don’t forget to also consider what your waitstaff thinks since they will be the ones “selling” your menu to customers. By being on the front lines, your waitstaff are also helpful in gauging customer reaction and how often they convert to the new items. Keep in mind, these menu analyses should be conducted once a year (at minimum) for price and twice a year for seasonal items. Revisiting old and new items will keep your restaurant on top of what the hot items really are and what’s working when you introduce seasonal items. Changing your menu does not mean going back to square one, and it’s important to keep fan favorites around. If your restaurant is best known for its burgers, don’t replace them with poke bowls. But, what you could do is add a barrage of new toppings for your burgers. Add pineapple, mac and cheese, or a specialty sauce. Get creative! This will keep your burgers interesting and lessen the chance customers will grow tired of stagnant fare. It’s easier now than it ever has been to let your customers know what to expect when they eat at your restaurants. According to OpenTable, “86 percent of diners regularly check out menus online before dining out”, which could make or break their decision. Use Facebook or your website to post your regular menu and hype new specials, allowing new and old customers alike to stay in the know about what they can expect when they make a trip. Another way you can switch up your menu without recreating the wheel is to add a specials list. This can be where your seasonal and new items are housed while leaving the rest of your menu as it is. By only changing up a handful of appetizers, entrees, and desserts, you can have a consistent purchasing strategy and only worry about oddball ingredients with what’s going on the special portion of your menu. It can also allow you a section to play with trends, without going all in. Changing up your menu should not be limited to only food items. A cocktail list is a great space to enhance your profits with seasonal or trendy items. Like with food, you don’t have to completely order new ingredients for these drinks, just add a splash of seasonal flavor. Add peppermint during the holidays, pumpkin or apple in the fall, or even more tropical fruits like pineapple or mango in the summer. People are more likely to shell out for the added expense of a seasonal drink over a dish to get in the “spirit of the season”, making the right seasonal cocktail lineup a must. If you don’t already have a revolving door of drinks, drink menus should be updated at least quarterly to give guests something new to try. Varying your menu based can help bring in new customers but still maintain regulars. Online promotion, special lists, and rotating drink menus, along with regular menu analysis, can help your restaurant stay vibrant and profitable for years to come. What do you want your customers to see when they walk into your coffee shop? Plush couch seating where they can enjoy a latte, while watching morning rain hit your front windows? A no-nonsense interior that is serves the utilitarian purpose of getting them in, out, and off to their work day? 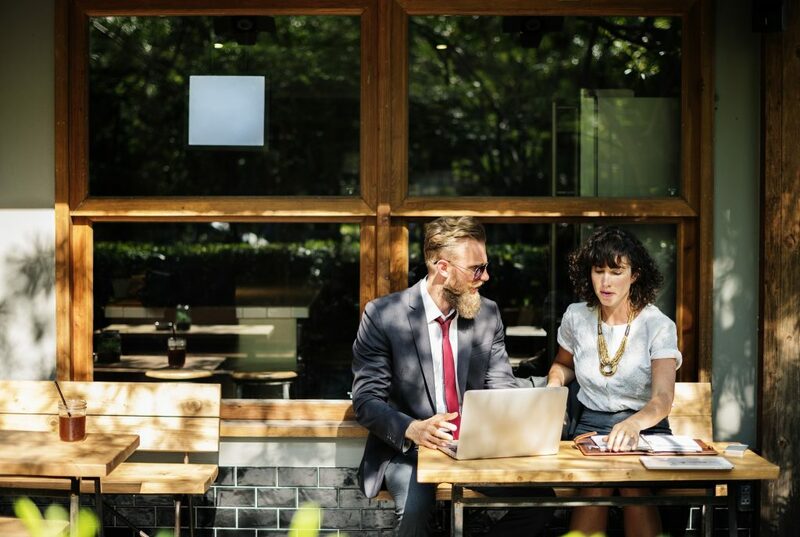 Furniture may not be the first thing that comes to your mind when opening a coffee shop but it’s a necessary step that can set the tone for your business! Creating the atmosphere of one of your customers’ first stop of the day is surely an important task. 1. What kind of seating should I have? The great thing about coffee shop seating is that it can be an eclectic mixture of seating: some bar stools here, chairs there, a loveseat by the window, the options are endless! So, if you’re focusing on which type of furniture you should get, consider the lifestyles of your target audience. Are you located on a bustling city corner where suits stroll in to grab their morning cup, or are you in a college town where students come to study and socialize Central Perk-style? If you have a portion of your menu dedicated to food, try out some booths, tables, and chairs. Or, go with a more bookish approach that oozes academia with couches, coffee tables, and a few bar stools at the counter. 2. How can I get extra storage space? Use your space wisely! Get furniture that can pull double duty and have built-in storage areas that are hidden from your customers. For example, having a hostess station that is equipped with storage shelves underneath the surface can save your staff trips to your back area and make refilling stirrers, napkins, and sugar more convenient. If you’re investing in booth seating, select models that have removable seats for some extra space. With lusher seating like love seats or couches, you can find coordinating ottomans that can be used for silverware or menu storage. The right furniture can help cure your lack of closet space and shelves in your coffee shop. 3. Are these tables durable enough? There’s no use crying over spilt coffee but there’s more to be said for the coffee cup. Many coffee shop owners forget to think about the effect their glassware will have on their table tops. Certain woods and finishes can be prone to scratching – especially since many ceramic coffee cups have a glazed bottom. Choose laminate, melamine, or Werzalit tops that are more resistant to scratches and the daily wear and tear of commercial environments. It also doesn’t hurt to select tables that are easy to wipe down and clean. 4. Should I have outdoor seating? Outdoor seating can be a great advertisement for your business, and even better, you don’t need much of it. Just having a couple sets of tables and chairs by your entrance can call out to passersby’s that didn’t know they needed a cup of joe until now. Have your dollar stretch farther by choosing lightweight aluminum outdoor furniture that is easily stored for cooler temperatures. Now that you’ve asked yourself these questions, you’re ready to pick out your coffee shop furniture! For more information about choosing the best furniture possible for your coffee shop, give our customer care specialists a call at 800-986-5352. Should I Have Round or Square Tables in My Restaurant? The shape of a table is just the shape of the table, right? Wrong! The differences in round and square table tops represent a change in the flow of your restaurant and how easy it is to rearrange and accommodate various party sizes. Round tables are a flexible option because of how many people they can sit. It’s much easier for a hostess to squeeze in an extra person at a round top without defined edges and designated sides of the table. Restaurant owners should consider their fare before choosing a round table. Because of the “squeeze” factor, you don’t want to be cramming people in if your meals require multiple plates and more space. Round tables, especially larger sizes, can take up quite a bit of space, creating the perfect visual effect for a more cavernous restaurant. Square tables have a huge benefit in their versatility in that they are easy to push together to accommodate a larger party. Suddenly, your 15 table tops can transform into nine square tops and two rectangle tops by pushing three tops together. Having this kind of flexibility can be very advantageous if the party size that comes into your restaurant varies from night to night, or even the time of day. Our most frequent recommendation to restaurant owners is to order two different size tops that have the same edge length (such as a 30” x 30” and a 30” x 48”) so it’s easy to line up sizes when combining table tops for bigger parties. Another important to factor to consider when choosing between round and square tables is accessibility and ADA compliance. To accommodate space for a wheelchair, tables and counters need to be between 28”-34” tall and have knee space of least 30” wide, 27” high, and 19” deep. You should keep this in mind with your table top and base selection; some disc bases that have a solid, wider footprint can prevent a wheelchair from going in. At least five percent (or one if your count is under 20) of your tables need to be wheelchair-accessible for your customers. Using both table shapes in your restaurant can shake up your layout, especially if you’re working with a small space. There are a couple ways you can do this to add visual interest without seeming too cluttered. Restaurants that offer a private party room can buy both shapes, utilize larger round tables in the party room since they are best fit for bigger groups, and use square tables in the dining area where you have more flexibility. You could also put bar height bases under a few round tables and create high tops, leaving the rest of the dining room as square tables. Whatever table shape with you choose for your restaurant, be sure to keep at least 54” between round tables and 60” between square or rectangular tables to create a manageable service space to keep both guests and your servers happy. Need help getting started? Visit our site or give our customer care specialists a call at 800-986-5352 to choose table tops and more for your restaurant. Posted on Jul 13, 2018 in Design and Furniture Selection, Helpful Tips for Bar and Restaurant Owners, Restaurant Trends • Comments Off on Should I Have Round or Square Tables in My Restaurant? Summer is in full swing and your patio is being enjoyed by customers. As one of the first things customers notice about your business, your patio is your calling card to everyone that walks by. 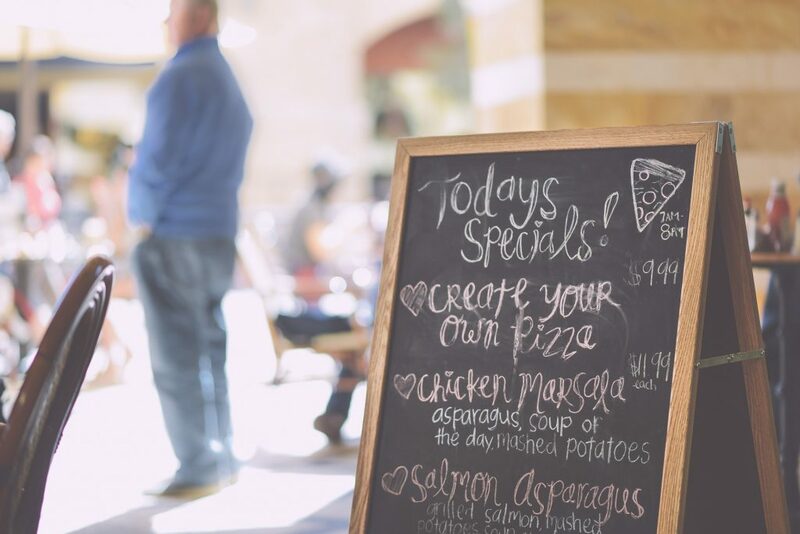 You want to send the right message to customers; One that says ‘Hey, come on in and enjoy a cool drink or great appetizer.’ It could be what propels them through your front door, instead of walking on by. 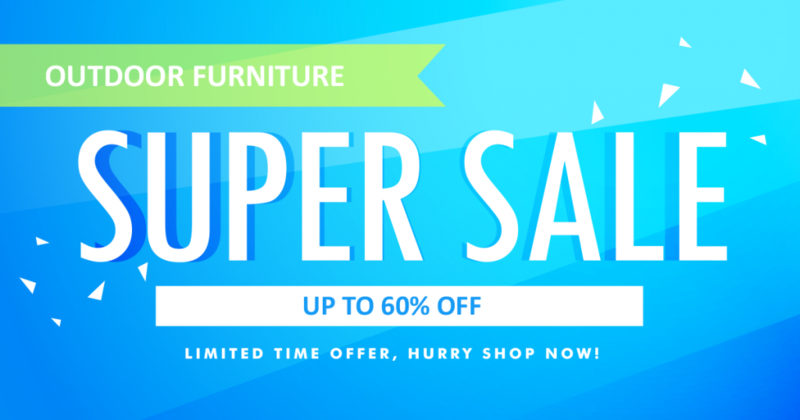 So if your outdoor area needs a little facelift, why not upgrade it for amazing prices by checking out our Summer Sale on outdoor furniture. We are offering incredible discounts on classic styles and new favorites. We have a variety of items: aluminum synthetic wicker, and poly lumber have all been discounted. Worried about making sure that your outdoor space doesn’t look like it was put together with discount items? We have put entire collections on sale so that you can achieve the total look that you are going for. All items are only available for a limited time and while in-stock. These items sell quickly, so act now to make your outdoor design dreams a come true all while staying in your budget.